Want the tl;dr of how I ended up here? Founded in December 2006, Bleeding Espresso began as a way for me to keep in touch with family and friends as well as drum up freelance writing business. Accordingly, from 2006 to 2010, I wrote about pretty much anything that struck my fancy from tidbits of southern Italian life, Italian traditions and holidays, recipes, interesting books, and much more — and this is what you will find if you page through the archives. In February 2010, however, I decided to shift focus, dig deeper, and really explore how my life has changed since I moved to Italy in 2003. I announced this change in Exploring New Directions: The Making of a Mission Statement. I started writing more reflective posts on ideas such as simplicity, mindfulness, and living in the moment as these have become the principles upon which my daily life are based. And now I’m back to writing about pretty much anything as it relates to my life here. For those who stop by for recipes, there will continue to be some of those as well; one of life’s simplest pleasures for me is spending time in the kitchen. Reading is also one of my greatest joys, so for those who enjoy book reviews, you can now find those solely on the Book Reviews page. I hope you will join me on this journey and share your thoughts and experiences along the way. Michelle Fabio, an American attorney-turned-freelance writer and editor, moved to her ancestors’ medieval hilltop village of Badolato in Calabria (the toe of Italy’s boot) in 2003. For more on this transition, please see When Olive Trees Smile: How Living in My Ancestral Village Changed My Life. Since then, she has assumed the care of various creatures from her darling pooches, Luna and Stella, and goat Pasqualina to hens, turkeys, ducks, rabbits, and guinea pigs at various times. Oh, and a baby girl, Marisa aka M, as of October 2013, who you can read more about at Baby Espresso. Michelle enjoys the simplicity of life in the south of Italy but also really, really loves her iMac, iPad, and other sundry Apple products. 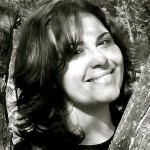 Michelle’s professional writing and editing site, including published clips, can be found at MichelleFabio.com, and her site about raising goats (currently inactive but archives still there) is GoatBerries.com. Michelle has been interviewed at Expats Blog, Location Independent: From Law to Italy; La Vita E’ Bella; The Food Channel; This Eclectic Life; Badolato.weboggi, and various others. If you have any questions, comments, or suggestions, or are interested in hiring Michelle for a writing project, please do not hesitate to contact her.